There is a strong contrast between the traditional management view of spare time and the kanban view. 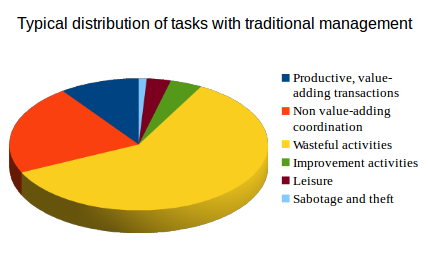 Traditional managers1 view spare time as something to avoid, as a sign of inefficiency or even laziness. One important responsibility of such managers is to keep workers busy. In contrast to this, network queuing theory—and kanban in particular—show us that keeping busy and generating long queues of intermediate work slow down throughput tremendously while increasing costs and waste. In most knowledge work, the high degree of variability in work items makes it extremely difficult to level the work. Reaching single piece flow, the apotheosis of lean manu­fac­tur­ing, is hardly possible in knowledge work. As a result, knowledge workers in a system following the kanban method will have spare time. How should they use that spare time? In order to overcome the traditional atavistic aversion to spare time,2 it would be helpful to demonstrate that spare time can be something other than goofing off, reading your private email or scanning your preferred social media site. In this discussion, I will contrast the traditional approach to spare time—considering it a form of waste to be avoided—with the lean and kanban approach to spare time—a precious resource that can be used for im­prove­ment and for unburdening workers from undue pressure and stress. Fig. 1: A traditional management approach attempts to minimize spare time. Improvement tasks are done via projects. How do we spend time at work? None of the first five categories should be entirely eliminated, even though they should not be performed in equal amounts (see Figs. 3 and 4). For example, let’s compare the transactional activities that add value to the ultimate output of an organization with the ne­ces­sary, but non value-adding coordination acti­vi­ties. Clearly, people who spend all day in meetings and in writing reports might complain that they never seem to get any work done. They are spending much too much time in coordination. But knowledge work changes all the time. So does manu­­fac­­tur­­ing work, to the extent that customer orders vary, pro­duc­tion im­prove­ments are made and products evolve. Thus, a certain degree of coordination is necessary. Wasteful work is, of course, any of the seven to nine categories of waste that have been defined in the lean approach to management. This includes such things as rework, movement, transportation and so forth. Finally, there are improvement activities. Let’s look at them in some more detail in the next section. I refer here to activities to improve how a team or an individual works. I am not referring to improvements in the normal services that the team provides. Suppose, for example, the team creates and manages applications. I am referring to the improvements in how it performs the creation and management activities. I am not referring to improvements in the applications themselves. Presumably, the former will contribute to the latter. In a “traditional” context, im­prove­ment often takes the shape of large projects intending to change or transform how an organization is structured, what its resources are and how it does its work. In a lean context, improvement is focused on the identification of problems and the implementation of rapid, in­cre­men­tal changes. We can, of course, learn in the context of doing and acting. But here I am referring to the learning that is done as an activity that is separate from other types of tasks. Such learning can be the result of formal training or of auto-didactic activities. We learn by reading, by listening to audio, by viewing videos, by par­tic­ipat­ing in face to face training, and so forth. Compare competitive athletics and military activity to what typically happens in a business context. An athlete spends long hours in training virtually every day. But the competition itself, such as running a race or skiing down a slope, might be only a tiny per­cent­age of the overall effort of the athlete. Similarly, modern standing armies spend only a small part of their time in fighting, whereas a large amount of time is spent in perfecting the use of weapons and preparing to fight. In a business context, the reverse is true. Suppose a new application is to be rolled out. The typical user is expected to attend a one hour training course, or view some eLearning videos, and is then expected to use the new application competently. But this hardly works well, ending up with inefficient use of the application, ineffective use of the application, perverted use of the application, incidents and the extensive need for support. Think of the simple example of how well people use spreadsheet software. Most are very inefficient users, performing most tasks man­u­ally and using the spread­sheet as little more than a piece of paper that can be easily erased and updated, with a few simple formulæ included. Some are power users, but even so, they master only a tiny per­cent­age of the tool’s functionality. As a result, performing anything but the most banal tasks often requires the consultation of docu­menta­tion, searching know­ledge bases, asking colleagues for help or raising a ticket with support personnel. Unless these additional activities result in some longer term learning, they are forms of waste. Perfecting the use of a tool or the execution of a task means taking the time to master a particular type of work, such that it becomes second nature and can be performed with little risk and waste. Just as the athlete learns through practice and coaching all the little techniques needed to run faster or jump higher, so can all workers invest time in perfecting their use of tools and their work methods. In the Toyota Production System, it was assumed that a true understanding of the causes of a problem would make the solution to that problem obvious. The hard part was in identifying the real problem. Thus, such methods as the Five Whys and Ishikawa diagrams were instituted. The issue is compounded if the organization tends to organize problem solving using a project structure. In addition to the coordination required to resolve the problem itself, this approach adds the overhead of project managers and project management offices. By virtue of the high priority given to a problem, there is increased stress on the problem solvers. The risk is that this stress become excessive rather than productive. As problems become more complex, so there is a tendency to want the most experienced and skilled workers to solve them. While this might help those workers learn more, it does little to help the more junior workers. Those working on solving a high priority might be motivated because they are visibly doing “important work”. But those not working on those problems might feel they are second class workers and are thereby demotivated. However, if the organization has a strong blame culture, the exact opposite might occur. There is no focus on only high priority, high stress problems. A full gamut of problems, some of which are not likely to be stressful at all, is covered. That being said, a little stress can help productivity so long as the cumulative stress is not excessive. When a full range of problems is addressed, there is ample room for junior workers to participate in problem solving and learn by doing. By allowing teams to work on the problems they feel are important, the team members gain the satisfaction of autonomously making improvements. They are not blocked by managers from doing the work they esteem. If every worker is expected to invest some time in ident­ify­ing and eliminating the problems that cause waste, it cannot be expected that every worker will be implicated in the resolution of top priority problems. Li­mit­ing work by priority has the effects of making some workers feel that they are less important than others and to lose the benefits of solving many problems. By encouraging work on solving all problems, workers can learn problem solving techniques and collaboration methods from simpler examples. It helps make problem solving an habitual, in-grained habit, rather than an activity performed only in the context of improvement projects. Some of the activities in a value stream might be wasteful. Eli­mi­na­tion of those activities would entail a value stream change. If a value stream has four phases—A, B, C and D—and it is determined that phase C is a non-value adding waste, it might be e­limi­nated. So this is really a case of removing wasteful activities, as discussed above. So, I refer here to more complex cases involving the change in the activities themselves, or a change in the order of activities. For example, suppose it were de­ter­mined that the value stream with phases A, B, C and D could be changed to phases A, C, B and D, in that order, and thereby reduce mean lead time by 20%. This change would be a worthy im­prove­ment, assuming the risks were acceptable and the tran­si­tion feasible. An example of such an improvement might be the change to test driven software development. In that approach, the tests are defined before any software is coded, rather than after the software is coded and built. This allows for testing in an iter­ative, incremental way, en­sur­ing the continued co­he­rence of the code base. This approach helps avoid large batches of tests, branching of code and issues that are difficult to troubleshoot. 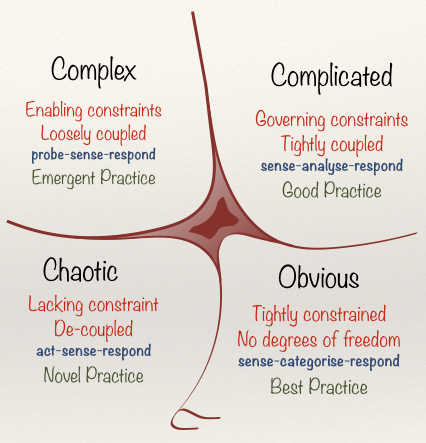 The Cynefin framework pro­vides another way of looking at such changes to value streams. In obvious and complicated systems, we sense before doing anything else. But in complex or chaotic systems, we probe or act before sensing (see Fig. 6). An organization might tend to view all of its work as obvious or complicated. But, as it comes to understand that some work is complex, it might alter the value stream to better achieve its goals. Since the inputs and outputs of the value stream are not changed in this type of improvement, little coordination is required with the workers performing upstream or downstream acti­vi­ties. The im­prove­ment could be made autonomously by the team, or teams, responsible for the value stream. If improvements are made by changing inputs or outputs of a value stream, there will also by changes upstream or down­stream of that value stream. This would probably require additional levels of co­ordi­na­tion, making such improvements more risky and expensive. This does not mean that changing value stream inputs or outputs should not be done. Obviously, such changes are inherent in the evolution of any goods or services. The example I gave only highlights the ad­ditional requirements for coordination—such as com­muniVca­tion, risk management, analysis and plan­ning—when more complex im­prove­ments are undertaken. Here is an example of the risk of changing inputs or outputs. I use a certain piece of software that recently released a new version in which the user interface was largely restyled, the functionality reorganized and some func­tion­ality eliminated. There was an unprecedented outcry by the users at these changes, who had to change the way in which they work. The software editor put little effort in coordinating with the users, beyond the support channel, which could only receive complaints and try to salvage what was left of the company’s reputation. Furthermore, the company probably changed too many things at the same time. An incremental approach would have limited the risks and provided more quickly whatever value was derived from the changes. Or, al­ter­natively, incremental changes would have made it much easier to back out of a single change. Above, I have examined the different types of improvements that may be made during spare time. In the following, I will look at the dynamics of using spare time for making im­prove­ments. My suggestions contrast with the traditional approach of im­prove­ment via big projects. In the big project approach, improvement is done as part of the regular, planned work, not during spare time. When will you have spare time for improvement? Note that the blockage of the flow of work should not result in spare time. Rather, it should re­sult in activities to unblock the blocked work item. The various activities to make improvement during spare time are shown schematically using BPMN notation in Fig. 7 and are discussed in more detail in the following. We assume that the organization (a group, a team, et. al.) has already done work to identify the improvements that it desires. This upstream activity is out of the scope of our analysis here. The question now is to which of those improvements the individual worker can contribute. In preparation for using spare time for improvement, the worker should have identified several types of potential im­prove­ments (to be done during spare time!). Ideally, there should be a mix of different types of improvement, as discussed above. Deciding on what to improve will come from various sources. The worker will be aware, from her own experience, of issues in the work. There will also be topics of discussion among members of a team regarding what sorts of things need to be improved. There may even be information coming from a manager. Ideally, such in­for­ma­tion should take the form of questions being asked by the manager that the worker cannot answer. Unfortunately, many managers fall into the trap of simply telling workers what to do. Thought should be given to breaking down the im­prove­ment activities into manageable chunks. Each block of time allocated to im­prove­ment should achieve something concrete. Doing half a task and then having to come back to it later is extremely inefficient. By reflecting on this question in advance, it may be easier to choose which, among various types of improvement, may be performed in a given block of spare time. For example, suppose a training activity has been identified which is to be fulfilled by following an eLearning course. The worker would naturally follow that course one lesson at a time. If a book were to be read, break it down by chapter. If the causes of a problem are to be analyzed, do not attempt to solve the whole problem. Instead, identify a tasks such as gathering data for analysis, or analyzing that data, or testing a hypothesis for a cause, and so forth. Note that I recommend against creating a prioritization scheme and always doing the task with the highest priority. Too much of the work depends largely on the circumstances of the moment. Thus, prioritization is a co­ordi­na­tion activity best honored in the breach. If anything, you can treat your improvement activities in the same way you use kanban to manage the flow of the rest of your work. Working on improvements is great, but what happens if several people work on the same task, but independently and without know­ledge of each other’s work? Such double-work can be a source of waste. 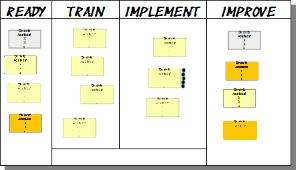 If you use the same principles of kanban to manage improvement work as any other work, the logical conclusion is that you use a kanban board to make your work visible. There are basically two options in this case. 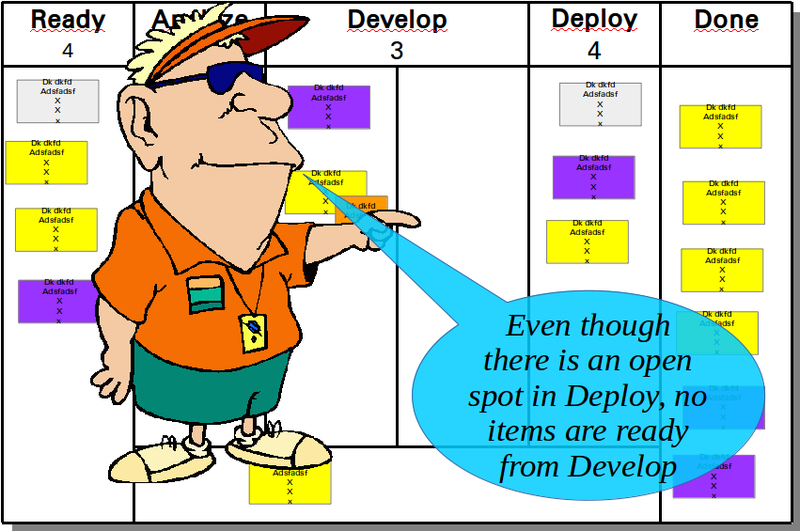 The first is to have a swim lane on the team’s main kanban board dedicated to improvement acti­vi­ties. The second is to use a separate board for improvement activities. Special care should be given to WIP limits if a swim lane is used. It might not be necessary to put WIP limits on improvement work, if it is only done during spare time. 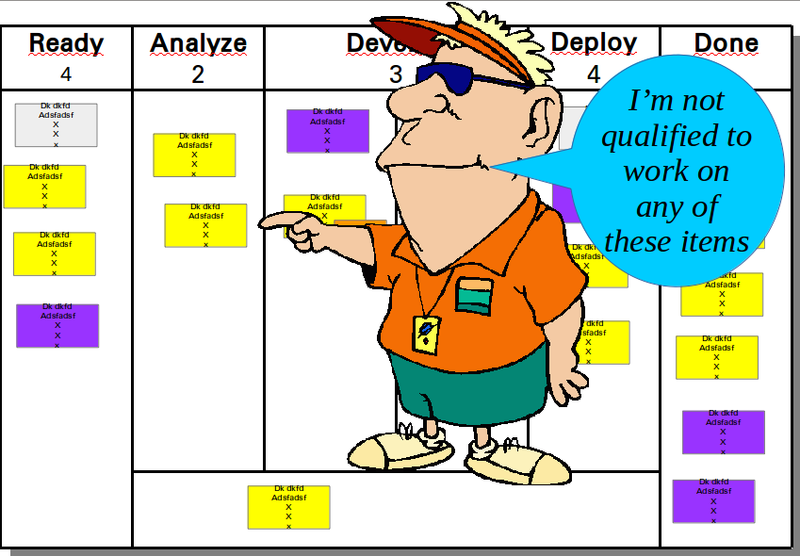 Therefore, if improvement work is displayed as a swim lane, the work items in that swim lane should not be counted towards the overall WIP limits of the kanban board phases or the WIP limits of individuals (if defined). Naturally, it is also possible to treat improvement work like any other work items, in which case it is not being done during spare time. 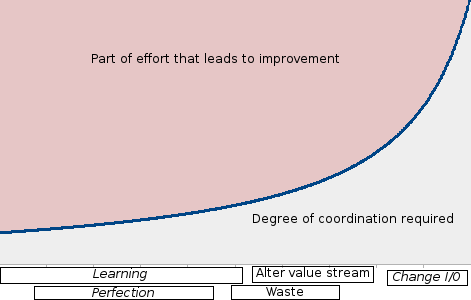 The value stream(s) for handling improvements might be very different from the other value streams of the team’s work. Hence, using a swim lane might result in confusing com­pli­ca­tions on the board. For this reason, a team might choose instead to display its improvement work on a separate board, but one without WIP limits. Each team shall have to decide, based on its own circumstances, which solution works best. Just try a solution to see if it works well. If not, try a different solution. But far be it from me to talk about how to organize your leisure time during working hours. So spare time may be an opportunity for improvement activities, but it should probably not be dedicated entirely to improvement. Have some fun! Each worker needs to find the right balance needed to maintain effective work, low stress, good relations with colleagues, good motivation and respectable work­ing conditions. 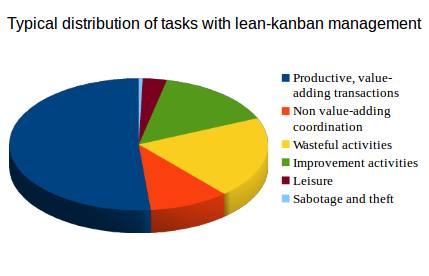 One of the principal benefits of the kanban method is to move from a situation where workers hardly ever have any spare time to a situation where having spare time is a regular occurrence. If you are always fighting fires and trying to catch up with work, it might not be necessary to think much about how to use spare time. But having a significant amount of spare time does make this an issue. I am reminded of cases where people stop eating and no longer have to shop for food, prepare it, eat it and clean up afterward. Suddenly, they have a large amount of spare time. How should it be spent? So it is for workers who succeed in improving the flow of their work. Unless a person is consistently a bottleneck, he or she will have spare time. So it behooves them to think about good ways of using that time. My intention has been to support a thoughtful approach to im­prove­ment by making good use of that spare time. The article Using spare time by Robert S. Falkowitz, including all its contents, is licensed under a Creative Commons Attribution-NonCommercial-ShareAlike 4.0 International License. 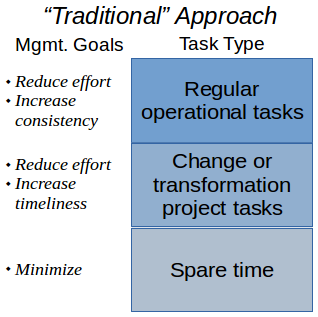 1 I use the term “traditional” to refer to the management practices that have characterized organizations during much of the second half of the 20th century. They are largely “command and control” practices based on a management/workers dichotomy. The role of management is to decide what to do, how to do it, who shall do it and when to do it. The role of workers is to do what management decides. In this approach, it is often believed that some workers will try to avoid work or make only a semblance of working. They like to goof off. It is thus the role of management to “crack the whip” to ensure that workers stick to their tasks, keep busy and work hard. 3 Units of work may be viewed as service acts or transactions where the output is delivered to the customers of that work. 4 Coordination is contrasted with the transactions (that may need to be coordinated). In lean terms, coordination is non-value adding. However, some coordination is necessary, while much coordination is probably waste. Thus, my taxonomy of tasks is not entirely orthogonal. 5 See, for example, https://pubsonline.informs.org/doi/abs/10.1287/orsc.1110.0709 or http://weblog.tetradian.com/2013/01/04/reframing-entropy-in-business/. 6 I am not suggesting that prioritization be completely abandoned. On the contrary, when a team or a person has the capacity to take on a new task and several candidates are ready to go, some method must be used to decide which one to do. 7 The availability of spare time is not, by itself, an indication that a WIP limit is too low. Indeed, it is critical for the good management of flow, as well as for having time for improvement, to not use resources at their full capacity. 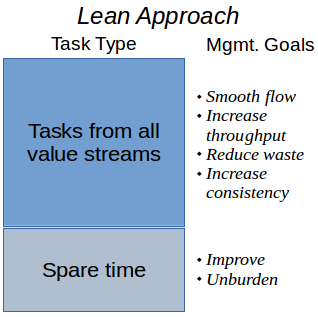 There is a strong contrast between the traditional management view of spare time and the kanban view. 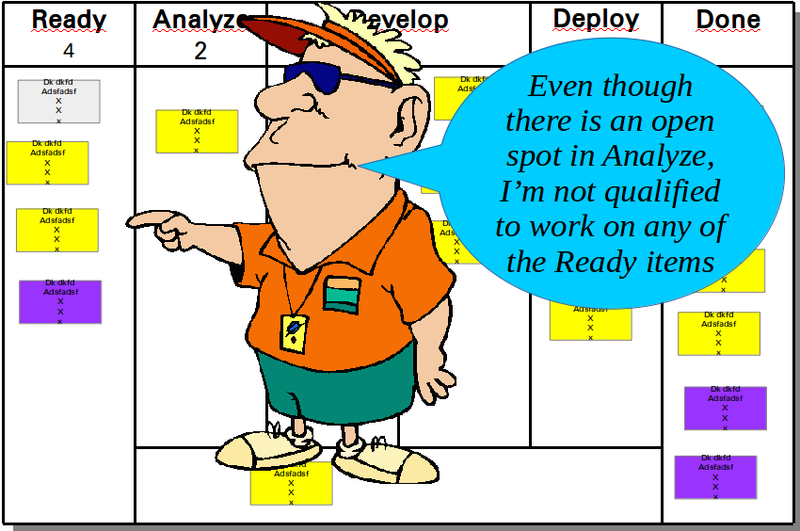 I examine spare time and continual improvement when using the kanban method.